Designing an outdoor living space is very similar to designing another room in your home. Choosing layout, style, and colors are all part of creating a space you and your guests want to spend time in. One of the first things to consider, for an outdoor living space in Minnesota, is a heat source. Outdoor fireplaces have really taken off in the past 5 years and are an excellent way to set the style and provide heat for your new space. Outdoor fireplaces, just like indoor ones, come in various sizes and can be custom built to fit your needs. Stone colors, fireplace doors, gas, or wood burning are all options and should be chosen on your lifestyle. For example, a gas fireplace is a simple click of a button vs a wood burning fireplace that requires gathering wood and cleaning. Beyond the fireplace, you’ll want to think about things like seating and how the setting sun will affect your experience in the space. You may want to consider umbrellas or a pergola to add shade to the area. 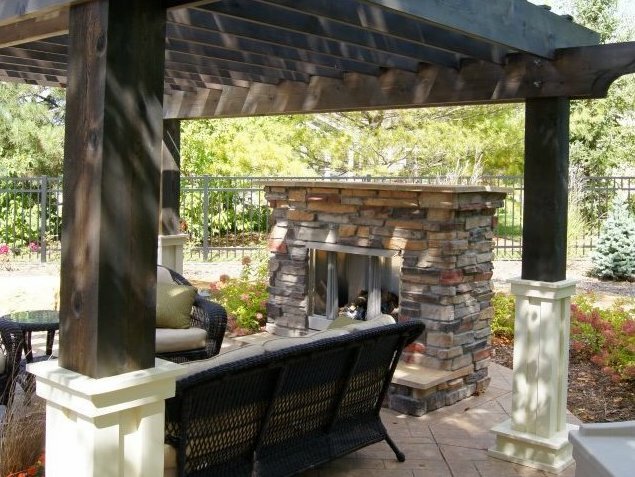 Pergolas especially add another design element to define the area of your outdoor living design. Outdoor cooking usually is part of the design as well. Pizza ovens, grills, gas stoves, and refrigerators are all pieces of the puzzle. The upcoming winter months are the perfect time to design and plan your new space. Our design consultants are experts in outdoor living and would love to meet with you. Call us today to set your appointment. It’s not too early to start your plan for Sping 2019.